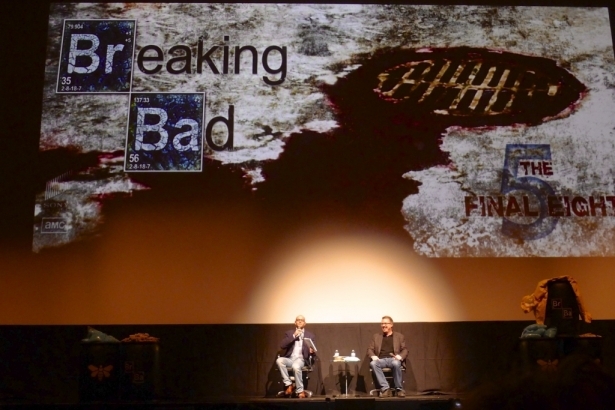 "Breaking Bad" creator Vince Gilligan visited Vancouver as part of the Vancouver International Film Festival's Film and Television Forum, and he brought some Blue Sky meth and a few barrels of cash with him. VIFF presented One Last Cook, in which Vince Gilligan presented his favorite episode of "Breaking Bad", followed by a Q&A moderated by "Lost" showrunner Damon Lindelof. The stage was adorned with barrels from Gus Fring's megalab, along with stacks of cash, bags of Blue Sky, and a now-iconic yellow hazmat suit. Everyone wanted selfies in front of those barrels. Was there a pizza on the roof of the Centre for Performing Arts? I didn't think to ask. For his favorite episode, Vince Gilligan selected S04E13, "Face Off"; already a fan favorite. Seeing a"Breaking Bad" episode on the big screen just confirmed the series' cinematic aspirations: those sharp sounds and expansive landscapes really hold up when projected in a movie theatre. The 1800-strong audience laughed and cheered with every twist: nobody stands in a round-the-block queue if they're only a casual viewer. Following the screening, Damon Lindelof took the stage, or maybe it was the Smoke Monster pretending to be Damon Lindelof. I couldn't really be sure. Vince Gilligan took the stage to a standing ovation, then sat down for the Q&A, which would include questions from fans via Facebook and Twitter. Lindelof asked, considering the whole premise of "Breaking Bad" is "Mr. Chips to Scarface", will Walter White utter the line, "Say hello to my little friend!"? Gilligan replied, [SERIES FINALE SPOILER ALERT] "No." Besides, Walt and his son watch "Scarface" in one episode, and Walt doesn't seem like the kind of guy to quote movies in situations of stress. 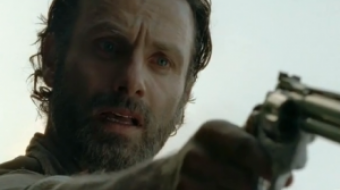 What is one line or moment that sums up the series? Gilligan: "Probably 'I am the danger', 'I am the one who knocks'." Gilligan also mentioned the scene in S01 where the bathtub comes crashing through Jesse's floor in a spectacularly gory mess. 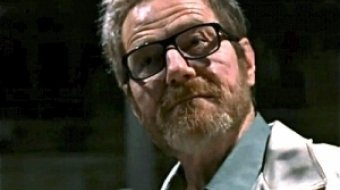 Do you remember how or when you came up with the concept for "Breaking Bad"? Gilligan answered that the idea came from a conversation with screenwriter Tom Schnauz, with whom he had worked on "The X-Files". 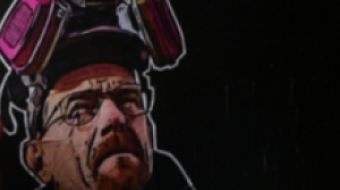 In 2004, after two years of unemployment, Schnauz had suggested (jokingly, if the DEA is reading this) that they rig up a meth lab in an RV and drive across the country. From there, Gilligan got what he called "that Archimedes-in-the-bathtub moment", and began to "explore the character of "a middle-aged schlub [...] who'd break bad."